A $300 non-refundable annual processing fee and the first-year tuition fee of $4,145 are due upon notification of admission. The 2019 Session dates are Sunday, May 19 through Friday, May 31, 2019. Final admission deadline is April 16, 2019. Please submit your online application using the form on this page or use the link to download a printable version. The admission policies of the Graduate School of Banking at Louisiana State University assure equal opportunity for all qualified persons without regard to race, religion, gender, national origin, color, age, or handicap. For security, upon sending your application, please call the GBS office at 888.278.0025 to provide us with your last four digits of your social security number to create your student ID. Thank you! The Graduate School of Banking at Louisiana State University operates this website under a disclaimer. 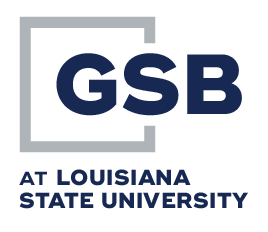 If you have any questions or problems while using this facility, please contact john@gsblsu.org.In compliance with the Americans with Disabilities Act of 1990, the GSB will make all reasonable efforts to accommodate persons with disabilities at its meetings. Please call the Graduate School of Banking at 888.278.0025 with your request.